Each Alaska Explorer itinerary comes complete with a Complimentary Pre-Cruise Package, providing you with a seamless way to board the ship and explore the local area. Arrive the day before your scheduled cruise date and American Cruise Lines will handle the rest. 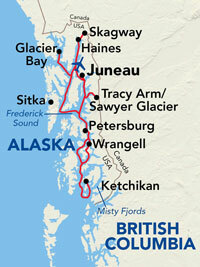 The package includes a premium hotel stay, a guided tour of Juneau, and transportation to the ship. 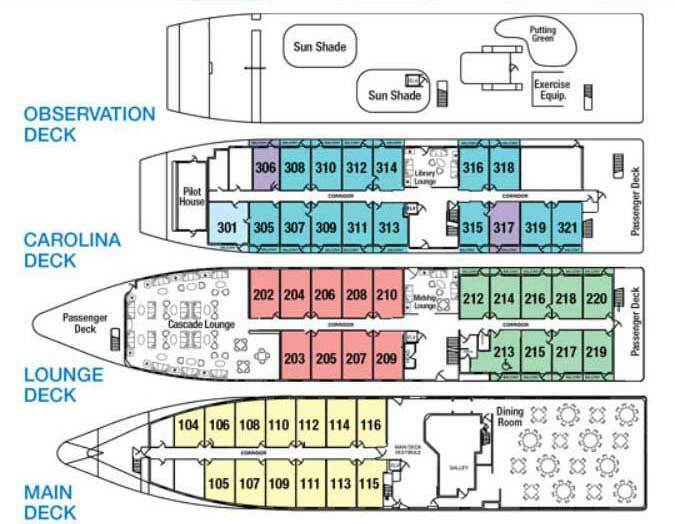 All luggage will be brought directly from the hotel and placed in your stateroom aboard the ship. * Pre-Cruise Package is not available for reservations made within 30 days of cruise date. Juneau is a charming town offering scenic views, great shopping, and native heritage sites. Arrive a day before your cruise begins to maximize your time exploring this unique destination. As you leave the dock to start your journey, enjoy views of forested islands, quiet coves, and rugged coastal mountain ranges. The restored town of Skagway us true to its past with period architecture and vintage streetcars reminiscent of the old frontier. Known as the “Gateway to the Yukon,” Skagway was central to the Klondike Gold Rush of 189..
s you explore Haines, our onboard expert and a local guide will take you through the valley describing the different species along the way. Get a up-close view of bald eagles which are among the most populous of over 260 species of birds in Chilkat Valley. Take advantage of the variety of activities available in Haines, including a guided wildlife expedition or a private kayaking tour on Chilkoot Lake. Glacier Bay is the world’s largest biosphere, covering 3.3 million acres of dynamic topography, including massive glaciers, temperate rainforest, and snow-capped mountain peaks. From the comfort of your private balcony, witness the native wildlife, including seals, whales, eagles, bears, and more. Glacier Bay is too magnificent to just spend a single day. Enjoy more time in this natural wonder as a park ranger joins us on board providing expert commentary on the landscape and native wildlife..
Petersburg is a thriving fishing community with a strong Norwegian heritage. Enjoy the relaxed atmosphere, as you explore the charming village of this authentic Alaskan town, located along the Frederick Sound. Ketchikan, known as the “Yosemite of the North,” is the gateway to Misty Fjords National Monument. Formed by glaciers and lava flows, Misty Fjords demonstrate the raw power of nature and the majestic results. Known as the "Gateway to the Stikine River,” explore the city of Wrangell and walk among the petroglyph carvings. Savor the flavors of fresh salmon and halibut, view bears on the mountainside, participate in native Tlingit culture, or stop and pick from the abundance of wild blueberries, huckleberries, and salmonberries. Spend the day cruising the Frederick Sound and Inside Passage. As we travel through stunning forest-lined passages, witness majestic wildlife and breathtaking scenery from a top of American Constellation’s spacious sun deck. Witness seals lounging on small ice floes, as you sail under the 1,500-foot-high vertical cliffs of Tracy Arm. On your way to the mile-wide South Sawyer Glacier, enjoy the magnificent sight of hundreds of waterfalls cascading down the sides of this amazing fjord. On your return, spend some time in Juneau. Explore the impressive collection of museums, shops, and attractions in the heart of Alaska’s capital.